We Go to Norcia | Sprezzatura, Y'all! Making the most of the time we have left is a little like trying to decide what to salvage from a burning house. You know you only have so much time and regret not organizing things a little better before the fire started. Today we went to Norcia, in the southeast tip of Umbria on the border of Abruzzi. We blissfully set out this morning – it was a beautiful, clear day, but very cold. We bundled up and loaded up in the car. Norcia is about 2 hours southeast of Anghiari, and I didn’t think to check the weather out there. It’s a lovely drive past Assisi, Spello, Trevi, Foligno, and many other cascading hill towns that spill down the mountains. These towns aren’t really on top of hills, they hug the sides of hills. On the way there, we noticed snow capped mountains in the distance. We had to drive through an extremely long tunnel, and when we emerged on the other side, the snow that we’d seen on the mountaintops was all around us. Not a lot of snow, but an impressive amount. We watched as the external temperature reading in our car went down. This wasn’t the drive in the country we had imagined. But it was beautiful. The mountains, the Appenines, are gorgeous. They’re so different from the rolling hills of Tuscany, where the hills are substantial, but gentle. The Appenines are rugged – more Rocky mountains than Appalachians. And somehow the roads through them seem more insignificant. You feel so dwarfed driving through these mountains – like you’re on the floor of a towering castle. Shadows, then bright sun. Anyway, we had no idea that we’d be driving into snow and ice. The roads weren’t bad at all, but it was dramatic how quickly the weather changed. When we got home, I looked up the elevation of Norcia – it’s 4,764 feet. Anghiari is 1,407. Atlanta is 1,050. The funny thing is, we never felt like we were climbing. But we obviously were. Norcia is known for its meat. Wild boar and other pork in particular. There is even a word in Italian, norcineria, for the products from Norcia. I’m not quite sure what makes the wild boar and pork from here so special, but after spending the afternoon there, I’m convinced that it is special and certainly deserves its own word in Italian. Norcia is also known for the lentils that grow there. Again, I don’t know what makes them so special, but they are. I know. I had them. We went there for the food. And we weren’t disappointed. We bought a lot to bring back to the U.S. and some to have over the next two weeks. The meat is wonderful. The cheese is unbelievable. It was worth the two hour drive into the snow and ice. We stopped in every meat and cheese shop we passed and had lunch in a wonderful place with a wood fire in the middle of the room that they cooked over. It was a great day. We talked about the pros and cons of going there in the winter instead of the warm weather. We decided today was the perfect day to visit there – no tourists, we got to see the snow, but it wasn’t bad, and it wasn’t crowded. Lunch was exactly what we hoped it would be. We had an antipasto plate of meat and cheese from the area. Divine. Then Steve had a pasta with pancetta and lemon – wonderful. I had lentils with sausage and it was just what I hoped it would be – luscious meaty broth with creamy lentils and hunks of fabulous sausage. Steve had cinghiale with olive and juniper berries. It was great. Cinghiale cooked perfectly so that it pulled apart with no effort and with a rich sauce that begged for bread to sop it all up. We were so happy and full when we left. Just what we wanted. The days now are even more precious than ever. As we count down to the end of our time here, we want to make sure we don’t waste a minute. Today wasn’t wasted. It was a great surprise to go to a snowy place with incredible food. Our favorite things – great food and great scenery. 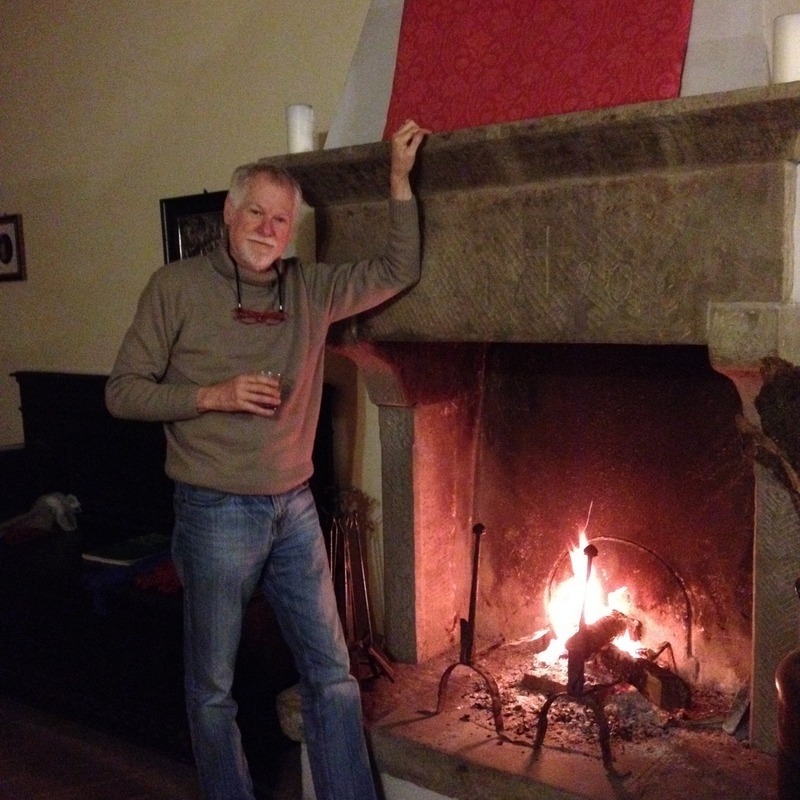 When we got back to Anghiari, it was cold. We came home full and happy and decided to build a fire and listen to Francesco de Gregori, an Italian singer who just released an album of Bob Dylan songs sung in Italian. Quirky end to a quirky day. Food and experience sound wonderful. Graham and I really got a kick out of the music! Thank you. So glad you went there! I’ve always wanted to go, but it seemed too far. Glad you made the effort! Looking forward to a taste of some of the goods:-)!